Can you tell me a little bit about the expansion? This is a project that is very near and dear to my heart. 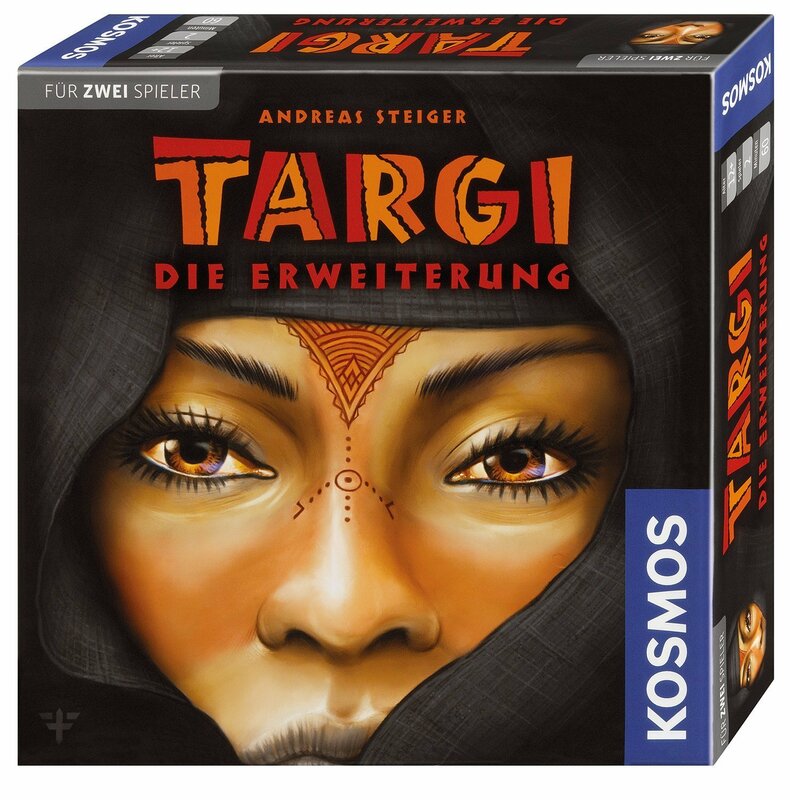 I still am a fan of the base game Targi and play it very often with my wife. Immediately after its release in 2012 I started to add some new ideas and new tribe cards to the game, just for my wife and me. After a while I had so much stuff that it would make a very cool big expansion for Targi. Kosmos the publisher is not a publisher that is known for releasing a lot of expansions for their games (except their mega seller Catan). So for a very long time it looked like they would not pick it up. But I liked to play around with the new ideas and so the expansion evolved and changed a lot over the years. I am very proud of it, and it is a very nice addition to the game. After all I worked over four years on it, and the long developing time really improved the expansion. What goals did you want to achieve with the expansion? I wanted to add even more meaningful decision and variation to the game without adding to much new rules. I am very active on the Targi Bord Game Geek forums and I tried to include wishes and requests from Targi fans around the world. One request for example was a weaker version of the fatamorgana boarder card. So I created one for the expansion. But everything new is compatible with the stuff from the base game, so players who don’t like the new card can use the old version. So that way I think everybody is happy. What does the expansion add thematically to the game? The tuareg women, the targia, have a very special role in the nomad society. They are on one side not allowed to accompany the men during their travels through the desert. They do however have the last saying in the household and rule over the tents and family decisions. Also they don’t have to cover their faces, unlike other nomad cultures. In the expansion we added a special targia pawn to pay a little tribute to the tuareg women. The targia pawn is a very positive figure in the game and rewards the players. We also choose to use a targia as cover for the game box. What does new mechanisms do it to the game? There are two major new mechanisms. First we have water as new commodity. With water as a new element, the tribe has more flexibility in how it will extend itself. More specifically, in the game water functions like a joker, e.g., you can swap two water tokens for any one goods token. Many of the new tribe cards, which replace the set in the base game, allow players to choose to spend gold or water tokens, which can make it a little easier to build. Water also allows you to do some special actions and you can gain bonus points for leftover water tokens at the end of the game. Secondly we have shifting sand cards. They gives the players a rather strong immediate advantages when you place a Targi on it. But since these shifting sands are placed next to the central playing area you will lose an intersection on the central cards. Therefore you give your opponent much more space on the main playing area. This is the element with the most profound impact on the way you play Targi. On top of that there are many small additions to the game as well, like new tribe cards, new boarders cards and such. Does it change any base rules of the original? All the base rules of the game stayed the same, I did not want the players to relearn a game they already know. Does it make the game more complex? Yes a little, because there are more elements that you need to take into consideration. Even some of the tribe cards offer you choices now. For example there are cards with additional cost, that you can pay voluntary to make the card more valuable, but that could mean those resources are now missing for your next card that you wanted to buy. Choices like that need to be taken into consideration constantly. Therefore I would recommend players that are new to Targi to first play two or three games of the base game before adding the expansion. In what way does it effect the game length? After your first game, the playing time should only be 5 to 10 minutes longer. The number of rounds during the game stay the same. I didn’t want that the game to overstays its welcome. How is designing an expansion different from designing a new game? On one side it makes things easier cause you create new ideas within a system that is already working well and you have a lot of experience with. On the other side you must find the right balance of elements that players already know and love but also new ideas that the players didn’t expect. So you don´t want to be to samey, but also you don’t want to change the feeling of the base game too much. That is quite a balancing act to do well. You also have to make sure that every new element is working fine with every already existing ones, and that they will not cause unwanted rules questions or combos. What languages will the it be available in? But I will provide English paste ups and rules translation as files on Bord Game Geek. Are you working on any other games and can you tell us a little about them?